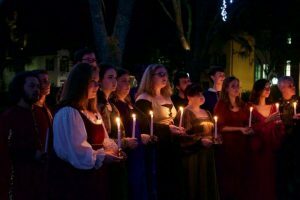 The award-winning College of Charleston Madrigal Singers, conducted by Dr. Robert Taylor, will perform sacred and secular traditional holiday season carols in dinner theatre format. Each of the three evenings will be filled with Renaissance entertainment and a feast fit for royalty. TICKETS: CofC Faculty/Staff $45, General $55, Preferred seating $65 Alcohol can be purchased separately at the venue. Purchase tickets ONLINE. Send your questions and seating requests to cofcmadrigaldinner@gmail.com or call 843.953.8231.